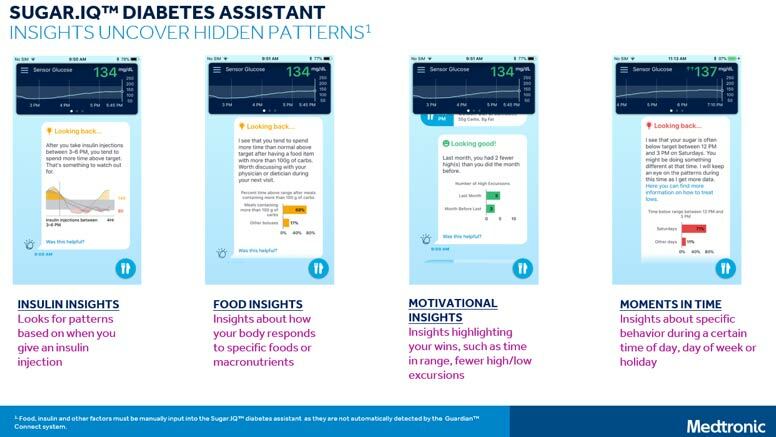 Medtronic’s new companion app for the Guardian CGM brings analysis features. There are apps for pretty much everything. Need a ride, a restaurant, a date?! There’s an app for that! Our diabetes tech has also begun to come with an app! The InPen links a bluetooth enabled injection pen to an app. MySugr has an app with tracking, education and even management coaching from a CDE in the palm of your hand. Dexcom’s sensors link to an app for viewing and sharing CGM data from your mobile device, or even your watch! Now Medtronic is stepping up its app game. The Guardian Connect Smart CGM system pairs the Guardian Continuous Glucose Monitor(CGM) with a companion app. The Guardian Connect sends data to the mobile app every 5 minutes. Like the Dexcom, system this will allow viewing of blood sugar data and trends on a smart phone. The app also has user enabled alerts for high and low blood sugars, including predictive low alerts. Alerts can be scheduled for different times of day. Data can be shared with providers via Carelink automatically whenever the mobile device has an internet connection. The app can be set up to send text alerts to up to 5 care partners who can also view blood glucose data live with an internet connection. And like Dexcom the app can be synced to your Apple watch as well. So what makes this system any different form currently available CGM/app pairings? Analytics. The Guardian Connect CGM system works with Sugar I.Q. This app is designed to analyze our patterns of insulin use, food intake and behavior to report trends to the user. Though the system cannot tell you what dose or setting adjustments to make, it can be helpful to identify patterns and help users identify a cause and effect relationship that they can then work with their health care team to take action on. (Medtronic is very careful to remind that “The system is intended to complement, not replace, information obtained from standard blood glucose monitoring devices. All therapy adjustments should be based on measurements obtained using a home blood glucose meter and not on values provided by the system”) So users should not expect to get a message telling them to take 33% less insulin for lunch before their work out, or to decrease their carb ratio by 2 for dinner. Messages will be more like ‘When you do this, there is a pattern of that‘ and users will then be able to use that information to inform their dosing or setting choices. This is a great innovation in CGM technology. We have gone from a system that tells us what our blood sugar was, to a system that tells us what it is, to a system that predicts what it will likely be. The next step in this growth is a system that gets smart. A system that starts to put together the many moving pieces of our diabetes life and spot trends. The hope is that, in the future, these systems will even be able to give us guidance as to how to not only react, but proactively improve our management and prevent adverse events. Guardian Connect with Sugar IQ is set to do a limited launch this summer and while it is targeted toward people with diabetes using injection therapy, it would also be of help to those using a pump. This brings us to potential draw backs. Medtronic has long been known in the diabetes world as a marketing machine. So if you are using a non Medtronic pump and want the Guardian Connect system, be ready for the HARD sell. You will likely feel the force of Medtronic’s sales giant doing everything they can to get you onto a Medtronic pump system. Since this is a Guardian CGM you are also signing up for a mind boggling sensor and transmitter taping process and a lot of pieces to pack for a trip. (Sensor taped to hold in place, then under tape to hold it in place again? then tape the transmitter in place, then over tape the transmitter to hold it as still as possible, then hope it all holds for a full 7 days of use?) The Medtronic sensor has a 7 day wear life and trying to reuse it beyond that is (not recommended by Medtronic or FDA approved) problematic and often not worth the trouble. (First you have to somehow disconnect the transmitter from the sensor without undoing all that taping, then accuracy often only lasts a few more days) . Medtronic CGMs also require a calibration 3-4 times daily. And by require, we mean that if you do not calibrate you stop receiving data entirely. Unlike the Dexcom that recommends calibration, but if you don’t get around to it you just risk inaccurate data until you do calibrate, the Medtronic sensor stops giving data if a calibration is not entered every 12 hours of sensor use. All for a sensor who’s accuracy is a bit less than that of the current Dexcom G6 with no finger stick calibration at all. Time and use will have to tell whether the analytics provided by the Sugar IQ Diabetes Companion are useful enough to outweigh the improved accuracy and ease of use of Dexcom CGMs currently available. But this is a great step in a direction we have all been waiting for. Haven’t we all, at some point, sighed and said “I wish someone would just tell me what to do” Well this system has not come that far, but it has the potential to help us gain some insights. “We are decades away from being that lucky!” There is a whole world of living that impacts our blood sugars. The educators at Integrated Diabetes Services not only help our patients identify trends, but we help them tailor their treatment, and gain knowledge and empowerment to proactively deal with the ups and downs of life. There will not be an app in my lifetime that can figure in hormones, emotions, climate changes, digestive fluctuations and litany of other variables that we learn to factor into our management. So, while I look forward to the day that technology leaves us unemployed (either by treatment or cure) I am glad to see developments moving in that direction. Yeah, its only for Apple devices at the moment so useless to me with an Android phone.